Elegant white swimsuit with red poppies and ruffled shoulders. Janie and Jack. Up for auction is a pair of Janie And Jack Girl's Size 10 One Piece swimsuits. Both are in very good used condition and from a smoke free home. Shipped with USPS First Class Package. Half-zip one-piece racerback swimsuit. Cover-up skirt with elastic waistband. Sports Apparel. Shell: 80% nylon, 20% spandex. Lining:100% polyester. Color: black/pink. For orders made before 3 PM ET. Lands End Girls 2 piece swimsuit size 10; pink with tiny white flowers print, bikini halter-neck top, skirt bottom with attached shorts. Condition is Pre-owned. Over all good shape, though the fabric in the waistband and underbust (where there is elastic) is slightly yellowed.not so much most people would notice but I did want to disclose. You are purchasing a Justice Girls Swimsuit in size 10 in great condition - no holes, stains or tears. GIRLS TWO PIECE BATHING SUIT- SWIMWEAR. 82 % POLYESTER 18% SPANDEX. This auction is for a girls Speedo swimsuit, size 10. New with tags will be listing more swimsuits so please check my other options! Pay shipping on one and the rest will ship for free! Girls Tyr Swimsuit Size 10 26. Condition is Pre-owned. Shipped with USPS First Class Package. 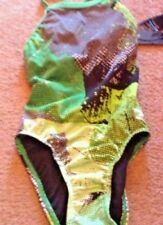 Girl's Speedo 2 Piece Tankini Swim Suit. Purple Aztec. Great set of 2 girls swimsuits / bathing suits from the Gap. Bathing suit reads L (10) regular. THIS ITEM HAS NO HOLES OR STAINES. Pre owned with signs of being worn/washed. Still in good shape. Very good used condition girls 10 T bathing suit hearts with a little ruching in the chest area. Very little pill laying on the speeding suit. Up for your consideration is a Jantzen girls size 10 bikini. DOLFIN SWIMWEAR. BATHING SUIT. POLYESTER & SPANDEX. ZERO POSUR SWIMWEAR. TWO PIECE BATHING SUIT. Size 10. Great quality durable material! Swimsuit with seperate short piece. Bought from Kohls. Worn twice. Sale price was 49.99 retail 59.99. Neon Pink, Black and White colors. Ships with USPS First Class Package. The one-piece swimsuit features a geo print in teal, white, and yellow. The suit is fully lined. The suit is 80% nylon and 20% spandex and it is in very good used condition with no stains, tears, pilling, picks, or holes but there are a few picks on the seat and slight pilling on the seat lining. Cute classic one piece and coordinating rash guard shirt: Size: 10 ALMOST NEW. 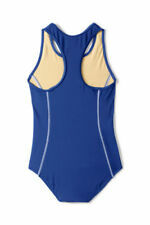 Speedo Girls' Infinity Splice One Piece Swimsuit. Silicone grippers at leg openings prevent suit from riding up. 80% Nylon, 20% Creora Highclo Spandex. Fabric: 80% Nylon, 20% Creora Highclo Spandex. Item is New. 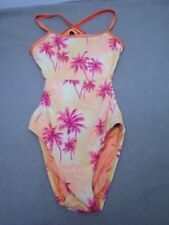 Girls One Piece Swimsuit Size 10/12. Condition is Pre-owned. Very good condition! I guess I cut the tag out, I bought it for my Grandaughter, only worn s few times, I know I bought it at Dillard’s and I’m pretty sure it’s s Jessica Simpson, it’s lined , been washed in Arm&Hammer Fragrance Free. Smoke free and pet free environment! Girls sz 10 LANDS' END SWIMWEAR Swimsuit-1 Piece, Fully Lined, Beautiful Colors! This is a Lands End Girl's One Piece Swimsuit in Size 10. Very gently used. Fully lined. No stains or tears. So it adapts to girls body. Beautiful colors and comfortable. 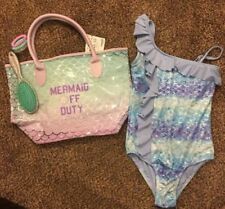 Justice Girls foil die cut flounce BIKINI SWIMSUIT VERY CUTE Size 10 NWT!! Girls Justice Pink Paisley 3 pc Bathing/Swim Suit, size 10. Top and full paisley bottom have been worn but are in excellent condition, with little to no piling on the bottom. The 2nd bottom piece is new and has never been worn. Circo Girl's Bikini Swim Suit size 10/12 L in GUC, mild pilling on bum.